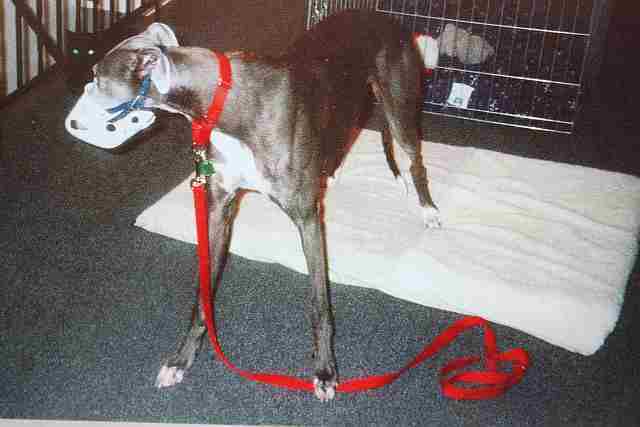 My story began in January 1999 when I first heard about a little greyhound named Excel, thanks to Marilyn Wolkovitz of Greyhound Adoption Service in Salisbury, Massachusetts. I can’t say why I desperately wanted to adopt this dog, especially because there are so many other wonderful adoptable greyhounds available. At one point Marilyn had the most handsome blue male available for adoption; he was even cat-safe. Having cats, this was a plus. Although I was tempted to take him, I had to wait for my Excel. There was just something about Excel I thought special. Living in Staten Island I wasn’t able to see her race, but I checked the National Greyhound Association race results each week to see how she was doing, waiting for the day she would grade-off. So many times Excel was at the brink of grading-off, then she’d come back and win a race. She was not a great runner. She’d bounce back and forth from D to C. She never did make it to Grade B, so I kept waiting for her to grade-off and retire. During this long waiting period, Marilyn and I talked a lot about whether or not Excel would be cat-safe, something I knew would be an issue, having four cats (Mooie, Terror, Sissy, and Bitty). We wondered if Excel would be a very dominant female who wouldn’t get along with my other greyhound girls Hollywizz (Sly Heather) and Phoebe (Cheyenne Phoebe). On August 12, 1999 Excel, at long last, had officially graded-off. I was doing my own version of happy dances in the house — my little girl was retiring! A week later Excel arrived at Marilyn’s kennel, a very happy-go-lucky greyhound. Except for a scruffy, flea-bitten coat, Excel was in perfect health. I knew Marilyn would give Excel a couple of days to settle in and then cat-test her. After so many months of waiting, I didn’t think I could wait to hear the results. Finally Marilyn called to give me the bad news. Excel’s initial cat tests were not good. She stared at the cat and if the cat moved, she lunged for it. My heart sank. So many months of waiting and hoping turned into disappointment. But Marilyn did cheer me up a bit by saying she would retest Excel in another week. I didn’t have any long-term experience in training dogs so I knew I had my work cut out for me. When I adopted Holly she just wanted to play with the cats and after a couple of “no kitties,” Holly never bothered them again. Phoebe on the other hand, didn’t want anything to do with the cats and would walk in the other direction. 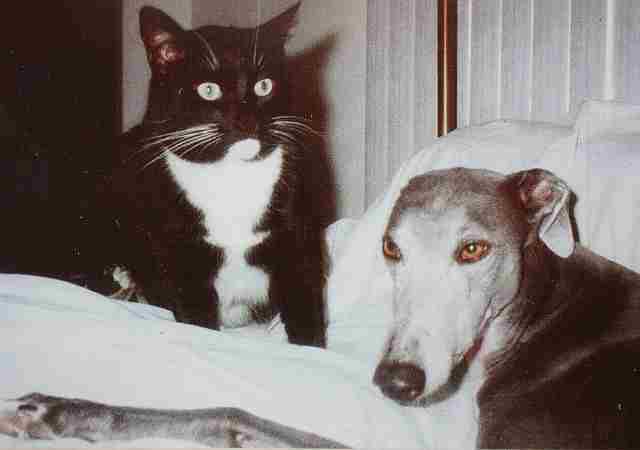 I sent a post to the Greyhound-L asking if it was possible to train a high-prey drive dog to co-exist with my cats. To put it mildly, most of the responses I received were discouraging. Most told me I shouldn’t even try to bring Excel home. Other people wished me luck and gave me some very helpful suggestions. What to do? Well, I knew I had some time before I made my decision; Marilyn was going to videotape one of Excel’s cat-test sessions and send it to me so I could see Excel in action. When I viewed the video I saw Excel in all her glory — leashed, muzzled, whining, and, sure enough, lunging toward one of the test cats. I also saw Excel taking commands well from Marilyn. She succeeded in getting Excel’s attention away from the cats, so there was a glimmer of hope! I knew in my heart I couldn’t let Excel go to another home without at least trying to cat-train her. So, on the day of Hurricane Floyd, Holly, Phoebe, my Mom and partner in crime with all our animals, Jan Metz, and I took the five-hour trip to Salisbury, Massachusetts to meet Excel. What a great day — hurricane and all — to finally meet Excel in person! Holly and Phoebe seemed fine with Excel, although Holly much preferred the handsome black greyhound, Krybaby who has since been adopted. While we were at the kennel Marilyn cat-tested Excel one more time so we would know what to expect. Off we went back home with our new, not-so-cat-safe greyhound. Plus, she would be the third female greyhound in the household. Excel looks for a cat! I took a solid week of vacation and worked with Excel. I leashed her to me every day and muzzled her. I was calling her Hannibal Lechter (from the movie Silence of the Lambs) because her muzzle reminded me of the mask Hannibal wore in the movie. I walked Excel around the house, letting her go into rooms where the cats were. When she spied a cat, she went into her stalk position. At those times, I growled “no kitty” and squirted her with a water gun. This instantly broke Excel’s concentration and I praised her. I set up Excel’s crate so that she would see into the kitchen and made sure she saw the cats being fed their breakfast and dinner. Then I fed the other greyhounds. Excel got her food last. Around the third day of training, I started feeding the cats, this time with Excel right next to me, still muzzled and leashed. Two of my cats love to start their breakfast on my kitchen counter. As the cats ate their breakfast, I gave Excel a couple special treats with the hope that this would help her associate the cats with good things. Around the fourth day, I took off the leash, keeping the muzzle on. I let her roam around the house, keeping a constant eye on her. Three times Excel tried to chase one of my cats, and each time I was right on her growling “no kitty” with a simultaneous squirt of the water gun. The instant Excel stopped I took her muzzle in my hand and had her look me in the eye and again firmly said “no kitty.” Then I ignored her for approximately five minutes, which I believe helped a lot, as Excel is a very people-oriented greyhound. To be ignored is the ultimate punishment for her. Two weeks later Excel was walking around my house, no longer muzzled and no longer leashed to me. I still didn’t trust her uncrated if no one was home, but she had come a long way from that lunging, stalking demon I first met. I believe the best test for Excel was when we came back from Dewey Beach the next month. Excel saw the cats as they greeted me at the door and totally ignored them! Excel has been with us since September 17, 1999 and gets along very well with Holly and Phoebe. In fact I never hear any growling among the three girls. Excel thrives on love and attention, follows me and my first shadow, Holly, from room to room, and is a true lap dog. When there isn’t a lap to lie on, Excel has been known to use Phoebe as a pillow. We are very happy with our little girl and, best of all, she has learned to co-exist with our cats. My only problem now is trying to find a little room on my bed at night. It’s not so easy sleeping with four cats and three greyhounds in a full-size bed! Kris Metz resides in Staten Island, New York. Kris is happy to report that Excel has been perfect with her cats and the crate has been retired till the next greyhound joins the household. Kris attends greyhound events as “Kris’ Coats.” She buys material, makes coats, and gives all the profits to greyhound groups.